In autumn, there are three things I stock up on for the year: apples, pumpkins & winter squash and nuts. Apples are a dirty-dozen crop, so I only get them organic. From September onwards, I can get them in bulk from local farmers considerably cheaper than I can get them the rest of the year. For fresh eating, we eat as much as we like all fall; the rest of the year, I'm much more frugal with my fresh apple purchases. But much of the fall purchase of apples around here is stored for the year. With a gadget like the one illustrated, it is trivial to peel, core and slice large numbers of apples for putting up. As a bonus, you get these kewl spiral apple peels which are very entertaining to feed to chickens! Of course, you can make applesauce or apple butter and either can or freeze for use year-round and I have done each many times. But until last year, it had never occurred to me to dehydrate apples. Amanda posted about making apple chips and it's such an easy method that I adopted it as my favorite preservation method. They don't even need a lemon juice dip, I just run them through my peeler/corer/slicer gadget, dehydrate and store in quart mason jars. Easy! The chips are a yummy out-of-hand snack, but also work well in my crockpot "fried" apple recipe, which is a satisfying side dish. While I do love a nice sausage-stuffed acorn squash, when I consider my autumn stocking up, I am thinking primarily of butternut-type squashes. Botanically speaking, there are 3 species involved, but the distinction isn't between summer and winter squash, nor between pumpkin and squash. Butternut squash and pumpkin are the same species, just we tend to classify some as squash and some as pumpkin. When I moved to PA, I found these things called "neck pumpkins" ubiquitous in grocery stores, farmer's markets and even at auctions in October and November. I think most of us would call this a squash rather than a pumpkin, but whatever it is, it made the BEST pumpkin pie I had ever tasted and I was instantly hooked. If you aren't lucky enough to live in PA, you can grow your own, Google for "Pennsylvania Dutch crookneck squash" or "neck pumpkin" seed. You can't tell from the picture, but these are GINORMOUS. They weigh 15-20 lbs each! And the vast majority of meat is in the neck, making them a cinch to process compared to most butternut-type squashes or pumpkins. I buy enough in fall to last the year. I use them like canned pumpkin in pumpkin nut bread, pumpkin custard and pumpkin pies. I also use them as squash, roasted with sage for a savory side dish, or with honey and cinnamon for a sweet one, or just simmered and mashed with loads of butter. A neck pumpkin will keep for 8-9 months if it's stored in a cool spot. However, since I rarely need this much at once, when I start one, I freeze the excess. For pumpkin-type use, I stick it on a baking sheet, poke a few holes in it with a fork, then bake until soft. I scoop out the pulp, drain, and then use however much my recipe needs and freeze the rest in pint-sized containers. For squash usage, I peel and cube the whole thing, then after reserving what I will cook, I freeze the rest in quart-sized containers. Fall through early winter is the best time to get deals on nuts as they're in season. Oh, you can buy nuts all year, but they've been sitting in warehouses since the last harvest. If you stock up now and stick them in your freezer, the nuts you eat next May will be fresher than anything you can buy, aside from having been bought at a much lower price. Nuts, with the exception of coconut and macadamia, also have a lot of phytic acid, a chelator that removes much of the iron, calcium and magnesium from your GI tract, thus acting as anti-nutrients. Most of the phytates are in the skin, so buying blanched nuts reduces that considerably. Some folks soak their nuts in water, then dry them to make "crispy nuts", which also greatly reduces their anti-nutrient qualities. All that being said, we eat some nuts: as snacks, as nut butters, and in recipes like banana nut bread. My favorites are hazelnuts and pistachio, hubby's favorite is cashews, but we use more whole pecans and blanched almond meal than anything else. The most frugal thing to do would be to buy them in the shell, crack them open, soak and dehydrate, and then use them as is or make nut butters in a high-speed blender. And I have done that sort of thing in the past, but am simply too disabled now. I pretty much just buy and freeze shelled raw nuts. This is when they're cheap, so I grab them! 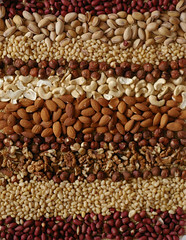 You can support this blog by purchasing from our sponsor for organic nuts. 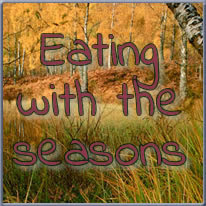 Do you eat and shop with the seasons?